1ABASHIN, S. is professor of anthropology at the European University in St. Petersburg. Among his publications is Natsionalizmy v Srednei Azii: v poiskach identichnosti (Aleteia 2007) and Sovetskii kishliak: mezhdu kolonializmom i modernizatsiei (Novoe Literaturnoe Obozrenie) 2015). 2ANTOSHIN, A. is professor at theUral’skii Federal’nyi Universitet (Ekaterinburg). He is a specialist on the history of the Russian diaspora. Author, among other publications, of Rossiiskie emigranty v usloviakh kholodnoi voiny (2008), Ot Jalty do Prazhskoi vesny (2011), Ot Russkogo Monmartra k Brighton Beach (2014). 3BRADLEY, J. C. is professor of Russian and modern European history at the University of Tulsa. He is author of Russian Voluntary Associations: Science, Patriotism and Civil Society in Imperial Russia (Harvard, 2009; Russian translation, Moscow, 2012); Muzhik and Muscovite: Urbanization in Late-Imperial Russia (California, 1985); and Guns for the Tsar: American Technology and the Small Arms Industry in Nineteenth-century Russia (Northern Illinois, 1990). His articles have appeared in The American Historical Review, Slavic Review, Russian Review, Rossiiskaia Istoriia, Obshchestvennye Nauki i Sovremennost’, and Vestnik Moskovskogo Universiteta. He is co-editor of Russian Studies in History: A Journal of Translations. 4CORPATAUX, Y. holds a master’s degree in political science and a master of science in information sciences from the University of Geneva. He has been head of the Graduate Institute Library since 1998. 5FAYET, J. F. is professor of history at the University of Fribourg, Senior Researcher at the University of Lausanne and Associate Researcher at the Centre russe, EHESS (France). He is the author of numerous publications on Soviet Foreign Policy and International Communism. Among these are Karl Radek (1885-1939): biographie politique (Peter Lang, 2004) and VOKS: le laboratoire helvétique: histoire de la diplomatie culturelle soviétique durant l'entre-deux-guerres (Georg, 2014). 6KOTEK, J. teaches at the Free University of Brussels (ULB) and the Institut d’Etudes Politiques de Paris. After completing research at St. Antony's College at Oxford he successfully defended his doctoral thesis at the Institut d'Etudes Politiques de Paris (IEP). The thesis was published in French as La jeune garde (Seuil, 1998) with and a short English version, Students and The Cold War (Macmillan/St. Martin’s Press, 1996). His first book was L’Affaire Lyssenko (Complexe, 1987). 7KUROMIYA, H. is professor of history, Indiana University Bloomington. Among his publications is Stalin’s Industrial Revolution: Politics and Workers, 1928-1931 (Cambridge, 1990), Freedom and Terror in the Donbas: A Ukrainian-Russian Borderland, 1870s-1990s (Cambridge, 2003) and The Voices of the Dead: Stalin's Great Terror in the 1930s (Yale, 2007). 8LIEBICH, A. is honorary professor of international history and politics at the Graduate Institute, Geneva, and visiting professor at the Global Studies Institute, University of Geneva. Among his publications is the Fraenkel Prize winning From the Other Shore: Russian Social Democracy after 1921, Cambridge, MA (Harvard, 1997). 10PANACCIONE, A. is former professor of contemporary history at the University of Modena and Reggio Emilia. He is the author of Kautsky e l’ideologia socialista (Milan, 1987), Socialisti europei (Milano, 2000), Il 1956. Una svolta nella storia del secolo (Milano, 2006), and editor of The Memory of May Day, English and Italian Edition (Venice, 1988). 11PIANA, F. is a post-doctoral fellow in women and gender history at the department of history of the State University of New York at Binghampton and has recently been Swiss National Science Foundation Fellow based at the department of history, classics and archaeology of Birkbeck College, University of London. She works on the history of international organizations, transnational movements and NGOs, prisoners of war, refugees, women, and gender in the 20th century. 12RABINOWITCH, A. is professor emeritus of history, Indiana University, Bloomington, and affiliated research scholar, St. Petersburg Institute of History, Russian Academy of Sciences. Among his publications is Prelude to Revolution The Petrograd Bolsheviks and the July 1917 Uprising (Indiana UP 1968 and 1991), The Bolsheviks Come To Power: The Revolution of 1917 in Petrograd (Indiana UP 1976) The Bolsheviks in Power: The First Year of Soviet Rule in Petrograd (Indiana, 2007). 13SIEGELBAUM, L. H. is the Jack and Margaret Sweet professor of history at Michigan State University. He is the author of Stakhanovism and the Politics of Productivity in the USSR (1988), Soviet State and Society between Revolutions (1994), and the award-winning Cars for Comrades: The Life of the Soviet Automobile (2008). He co-authored with Jim von Geldern the award-winning website “Seventeen Moments in Soviet History,” and with Leslie Page Moch Broad is My Native Land: Repertoires and Regimes of Migration in Russia’s Twentieth Century (2014). 14SUNY, R. is the William H. Sewell, Jr. distinguished university professor of history and professor of political science at The University of Michigan, senior researcher, National Research University- Higher School of Economics, Saint Petersburg, Russia, and emeritus professor of political science and history at The University of Chicago. 15VON HAGEN, M. is professor of Russian, Ukrainian, and Eurasian history at Arizona State University. Among his publications is Soldiers in the Proletarian Dictatorship: The Red Army and the Soviet Socialist State, 1917-1930 (Cornell, 1990). 16YAKIMOVICH, S. is a graduate of the Moscow Institute of Culture, formerly employed at the Library of the Financial Academy in Moscow. After moving to Switzerland, she is now responsible for the Boris Souvarine Collection at the Graduate Institute. 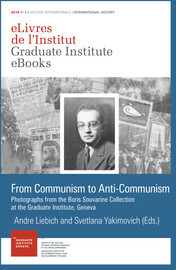 Contributors’ biographical notes In : From Communism to Anti-Communism : Photographs from the Boris Souvarine Collection at the Graduate Institute, Geneva [en ligne]. Geneva : Graduate Institute Publications, 2016 (généré le 26 avril 2019). Disponible sur Internet : <http://books.openedition.org/iheid/6664>. ISBN : 9782940503971. DOI : 10.4000/books.iheid.6664. Liebich, Andre, et Svetlana Yakimovich, (dir..) “Contributors’ biographical notes”. Geneva : Graduate Institute Publications, 2016. Web. <http://books.openedition.org/iheid/6664>. LIEBICH, Andre (dir.) ; YAKIMOVICH, Svetlana (dir.). From Communism to Anti-Communism : Photographs from the Boris Souvarine Collection at the Graduate Institute, Geneva. Nouvelle édition [en ligne]. Geneva : Graduate Institute Publications, 2016 (généré le 26 avril 2019). Disponible sur Internet : <http://books.openedition.org/iheid/6440>. ISBN : 9782940503971. DOI : 10.4000/books.iheid.6440.